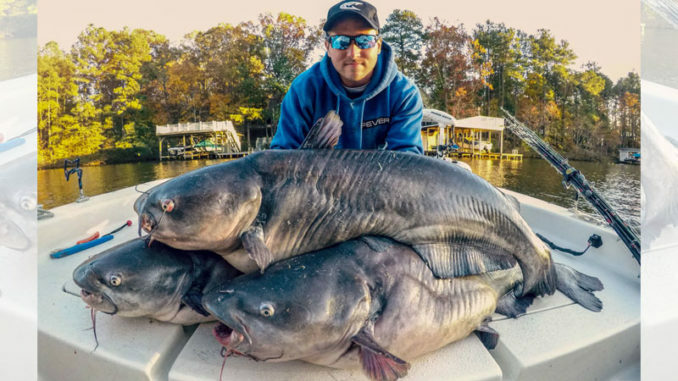 Zakk Royce has perfected techniques for catching huge blue catfish from Lake Gaston along the Virginia-North Carolina border. 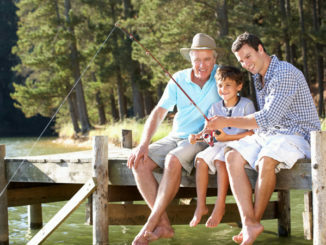 Many cold-weather fishermen say that the best part of the winter is having the lake all to themselves. 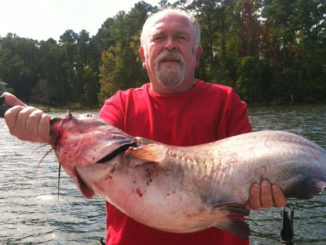 But if you’re a fisherman who targets catfish at Lake Gaston, you’re liable to be sharing it with some of the biggest blues of the year. They will be shadowing massive baitfish schools in deeper channels, and dragging a chunk of white perch will put them over the gunwale. Ground zero for Royce in December will be the main-river channel and deeper creek channels that are harboring schools of baitfish. 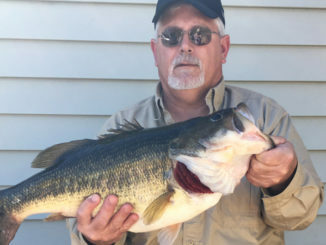 He regularly catches blues in 40 to 50 feet of water, but he has been successful all the way to 90 feet, Gaston’s deepest depths. With any luck, a flock of diving seagulls will give away feeding stripers pushing baitfish near the surface, but the baitfish are easily picked up on depth-finding units. Royce will be dragging his baits on the bottom, under the baitfish, a majority of the time this month — trolling at no more than a 1/2-mile an hour. He runs a 6-rod spread: two straight back, two off the gunwales, and two on side planers. On each line is a 3-way drift rig comprised of a 1½- to 2-ounce slinky weight and a 12- to 48-inch leader tied to a 9/0 circle hook with a 3-inch peg float in the middle. 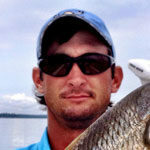 White perch is the winter bait of choice. Perch also feed on smaller threadfin shad and can be found near schools of them in the creeks. Dropping a Sabiki rig to them will load an angler with enough bait for a day’s fishing in no time.